I should have put this post about needing more fulfilment over here, but instead it ended up at Homestead Geek, so there it shall remain. A few afterthoughts came to me when reading the comments and musing upon how desperate I am becoming about the situation. First, perhaps this is my mid-life crisis. 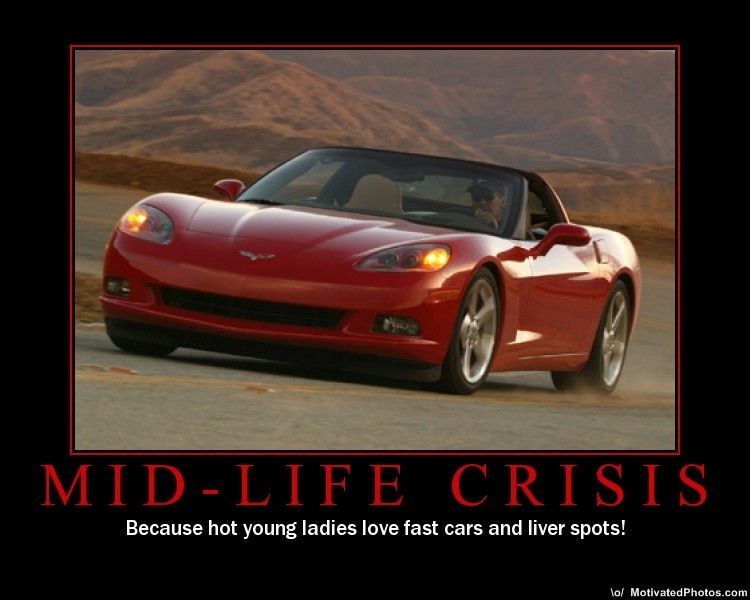 Sure, it doesn’t feel like one, but it probably doesn’t feel like a mid-life crisis to anyone going through one. Perhaps, though, there is a reason why we have mid-life crises – perhaps we reach a point where we can no longer put up with things, because we realize time is fleeting, and if we don’t make changes now, we may not get another chance. Second, even if I am fully in the throes of an MLC, that doesn’t make it any less real, at least, to me. If I were getting the urge to buy a Corvette, take up a twenty-something hottie lover and start wearing spandex, I might be less inclined to take it seriously. This MLC, however, seems to be presenting itself in a constructive manner. I’ve had similar “MUST CHANGE NOW!” urges that have led to some of the most radical changes in my life, most of which worked out exceedingly well. I should trust my gut on this, but practical matters prevent me from just Making the Leap. Alas.